This morning I’ve decided to share my frustration with having to manage external legal search engine optimization (attorney SEO) efforts that negatively affect our site and the quality content we generate. While I regularly need to clean out our forum from promotional junk that SEO agencies hired by law firms dump, I rarely have issues where a law firm clearly disregards communications to cease and desist these activities. I have absolutely no desire to infuriate any of my legal colleagues, especially in Florida where I’ll probably end up living as my days of enjoying the snow and cold weather are coming to a close. For the past few years a law firm marketing company has run a neglected content aggregator known as the “Law Bugle” on behalf of this Key West Law Firm. 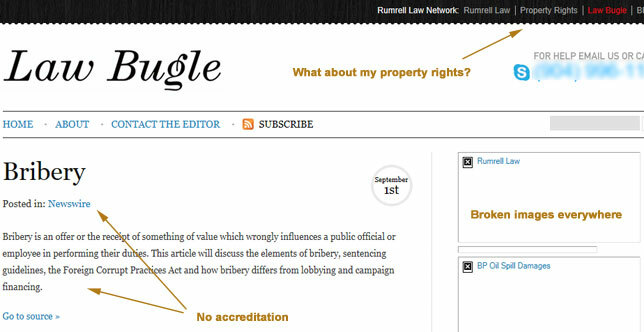 What does the Law Bugle content aggregator do? It finds RSS feeds that are open on sites and it stores what it pulls on their blog. Roughly 2-4 sentences of our content that appears at beginning of an article are stored on their site as a mini article with a link to find the rest. By doing so, the law firm hopes that a search on the topic of my article will bring up their lousy blog in search engine results. You might see it and click on their link instead of mine, see their law firm and phone number instead of our site, and you might call their law firm. And you’d never see my article or know that our site exists. It doesn’t matter to them whether they have permission or not. I’ve made it clear both on my site and in several emails to them for over a year that they have no authorization to do what they are doing. I sent several messages to several contacts at or in conjunction with this law firm instructing them to cease and desist this practice over the course of an entire year. After finally taking down dozens of our article excerpts, they are at it again! If you’re going to take our content without our authorization and branding, at least present it in some flattering manner, and not in the neglected slipshod fashion that looks like the work of a preoccupied seven year old child. Images are broken all over the site, errors will pop up when the pages load and the links themselves go to dead sites if they aren’t going to the law firm. If I wanted to really get even with this law firm and its SEO agency, I’d be posting the name of the law firm and their marketing and development company in this article as well as in several other conspicuous places on our site. Time is money – and they know that very well. I have no doubt that my search engine optimized articles on their law firm would come up. And then they would have to hire a reputation management company to handle the situation and deal with my efforts. How did I find them? Part of my search engine optimization tools include a subscription to SEO MOZ (now just known as “MOZ”) and the Ahrefs Site Explorer & Backlink Checker, which is perhaps the most extensive backlink analysis tools available. These tools cost serious money and Ahrefs is useful for situations just like this – finding sites that are creating backlinks which may not only harm your site but also indicate sources of content scraping. I am venting because this should be an easy problem to manage. And when you’re inundated by spammers and SEO marketers from India and the Philippines all day long, the amount of time it can consume is staggering. Here’s to hoping that the Law Bugle is playing Taps and will cease to exist in the near future. This group of lawyers certainly doesn’t want me to start playing Reveille.